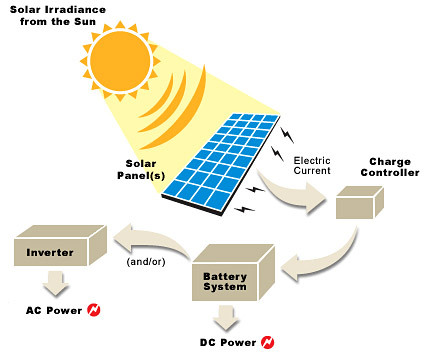 Sunlight can be used to directly generate electricity by the use of photovoltaic technology. The use of solar cells or photovoltaic arrays is getting more and more acceptable as an alternative and cost efficient means of generating power, a.k.a solar energy! We have a range of Solar products that will make your life easy and will help you save money and our planet. Speak to one of our Solar experts today and let us see how we can help you. How much of my total hot water requirements can a solar water heater provide? What is Eskom’s involvement in the solar water heating programme? Eskom is the implementation partner to the Department of Energy’s national solar programme. Eskom is supporting the department in working towards meeting government’s target of 10 000 GWh hours of renewable energy generation by 2013. Part of this is the financial assistance in the form of a rebate to assist hot water consumers to convert to solar. What happens in winter or on rainy days, when there isn’t enough sunlight to heat the water? The programme is structured around a rebate which reduces the selling price of a SABS approved or tested (limited time period) solar water heating system. The reduction in price is based primarily on the performance of the solar water heater and its associated electricity saving potential while taking into regard the prime interest rate, expected electricity increases. It also aims to bring the systems down to a 5-year payback period. You receive a rebate directly from the facilitating auditors of the programme after submitting a completed claim form obtained from your installer. Only registered products, complying with the following criteria, qualify for the rebate:The system must have passed the South African Bureau of Standards (SABS) tests, and comply with the South African National Standards (SANS) for thermal, mechanical performance and safety requirements. The supplier of the system must be registered with SESSA (Sustainable Energy Society of South Africa) solar water heating division – the industry’s self-regulating body.The system must be purchased from a registered supplier/retailer and installed by a registered installer. You will only be able to claim the rebate once the facilitating auditors receive a complete claim form and an accurate invoice. The system must have a timer to optimise energy savings and regulate everyday usage. The system must be appropriate for the household and area in which it is installed, in terms of size, frost protection and water quality compatibility. It must have a comprehensive guarantee of at least 5 years on all major parts. What are the life-cycle expectation of the system and the total energy savings on it? The mechanical performance tests e.g. hail, freezing and pulsation test (testing of the valves) are conducted to ensure that the minimum quality standards are met.The performance tests are conducted to determine how well the system works. The safety test determines if all the safety requirements are met, including electrical and mechanical safety criteria. Why is it important that solar systems get the SABS mark approval? In order for you to qualify for the rebate, the solar system has to be installed by an approved installer. Even though the concept of the system may look simple, many areas can be damaged if the system is not installed by a qualified tradesperson. Accredited suppliers register their installers and undertake to oversee the installations to ensure that they comply with programme and building regulations and other applicable legal requirements. A new plumbing regulation body has recently been formed (PIRB) which will allow customers to identify qualified and licensed plumbers. Therefore, if you have purchased a qualifying system and your local plumber is registered on the programme to install that system, you will be able to make use of them. The guarantees can be lost if it becomes evident that someone without the correct technical expertise has tampered with the system. Purchasing a system that is registered on the Eskom programme ensures that the system and the supplier have been checked and audited to the SABS minimum standard for solar water heaters, not only safeguarding you as a consumer but also giving you greater assurance of the system’s quality. Buying an Eskom registered system means you qualify for a rebate, making your purchase good value for money. How does this rebate work? You will receive the rebate directly into your bank account within 8 weeks after you have submitted complete and accurate claims forms, provided that the system and the supplier have been registered on the programme, and that the installation is done by an installer registered by the supplier. This relies on both you and the installer filling in the claim form 100% correctly and attaching the relevant documents requested. How much does a typical system cost and how much is the rebate? Costs can only be provided taking into account your specific hot water usage habits but an approximate cost can be given here. Installing a 200 liter solar water geyser costs approximately R15,000 with an average installation cost of between R2,000 and R6,000. The upfront cost of a solar water heater (including installation) is higher than electric or gas water heaters but the savings on your electricity bill will compensate for this over time. Once you have paid back your system, your hot water is for free. Where can I get registered as a supplier on the programme? Areas that experience frost (such as Gauteng) should only make use of freeze resistant systems. We do not have severe winters in South Africa, but we do have frost and temperatures below 4°C, which can cause systems to burst and fail. Do solar water heaters with a test certificate only (and not the SABS Mark of Approval) qualify for the rebate? Yes – however the test certificate is only valid for 12 months and then the programme requests that suppliers move to the Mark of Approval as this is a far better form of quality assurance – it is not simply a once-off test on a system. The Mark of Approval ensures that components of a consistently good quality, due to the regular system tests and factory quality verification.The bulk of systems on the Eskom programme are very expensive – won’t people rather buy outside of the programme. The Eskom programme is open to all suppliers selling SABS tested or Mark Approved systems. Eskom does not control or set the prices of systems in any manner. The aim of the programme is to set a minimum quality standard to protect the customer and industry as a whole. There are a range of systems registered with the programme and some lower cost systems that are busy being finalised for registration. You should research the technology as much as possible to ensure a good purchase. Why is there an insistence on a 5-year guarantee in respect of Eskom’s domestic electricity rebate programme when the industry norm is far less? In South Africa the industry norm for a conventional electrical geyser was 3 to 5 years and that of solar geysers was between 3 to 10 years. Internationally the solar geyser norm is 5 to 10 years. The average expected life span of a solar system is between 10 and 20 years, depending on a number of factors. Eskom has chosen a 5-year guarantee as we require the quality of systems to provide you with sustainable energy savings. But it is important to note that the 5-year guarantee is on the collector and geyser only, with only 1 year on workmanship, pipes and pipe fittings. The technology’s savings contributions in the specific market. The load factor of the technology (the daily duration that technology is consuming electricity). The need to provide technologies based on international benchmarks and standards to ensure a life span of between 3 – 5 years with a minimal impact on the environment – thus contributing to sustainability efficiency. The stipulated period is also a minimum requirement for the solar programme to effectively contribute to increase the reserve power margin and to limit additional generation expansion programme. How do suppliers qualify to be registered on the programme? If a supplier does not provide a 5-year warranty it cannot participate in the Eskom programme. To participate in the Eskom rebate programme, the solar supplier/retailer system has to abide by the following: The system must have an SABS Tested or Mark of Approval certificate. The system components must carry a 5-year guarantee. The system must be installed by an accredited installation team (this is now being altered so that it can also be installed by an accredited solar water heater plumber as classified under the new PIRB board. Each system will in future need to have a plumbing certificate of compliance on completion). The system must be installed with a load management device or timer. All standards and regulations must be adhered to under OSHACT, Building regulations, SANS 10142 and SANS10106. The supplier must the registered with SESSA industry body. The system must have an SABS Tested or Mark of Approval certificate. The system components must carry a 5-year guarantee. The system must be installed by an accredited installation team. (This is now being altered so that it can also be installed by an accredited solar water heater plumber as classified under the new PIRB board. Each system will in future need to have a plumbing certificate of compliance on completion). The system must be installed with a load management device or timer. All standards and regulations must be adhered to under OSHACT, Building regulations, SANS 10142 and SANS10106. The supplier must the registered with SESSA industry body. How does the Eskom rebate work for clients who are purchasing solar thermal or photovoltaic panelling? Eskom is not currently involved in offering photovoltaic panels or systems to homeowners. This technology is currently still expensive and not that widely available in SA. How long will the rebate remain at this level? Currently the rebate amount can be up to R8 900, depending on the system you buy. The increase in the rebate is in line with governments drive to increase the uptake of solar in the country and in so doing reach their renewable target. The aim of the rebate increase was also to provide a consumer with a payback of 5-years or less. How easy is the process to claim your rebate? The process for claiming is very simple. The reasons people think it is difficult is the market perception of Eskom and customers are being misled by suppliers that are not prepared or unable to join the programme as they are unable to meet the minimum requirements. There is one form to fill in (about half a page), which is supplied to you by your installer on the day of installation. The form requires you to attach a copy of your identity book, your invoice, your proof of residence and a copy of your utility bill. We give you a self-addressed envelope in which you can mail it to the facilitating auditors or drop it off in a drop box within 6 months. Within 8 weeks the rebate is paid into your bank account directly – if the requirements are met. The facilitating auditors will email or sms you to inform you of receipt of your claim or if the claim form is not completed in full. Please note: claims are only processed once they are complete. Therefore if you have outstanding information, your 8-week period will start once the rest of the information is received. When will legislation be ready on all new buildings and when will the tax rebates be available? The regulation for new buildings has already been gazetted. Soon all new buildings will have to be energy efficient by law. As for the tax rebates; once the application has been submitted to SARS, but there were no timelines or guarantees provided. Does Eskom have a low pressure system on the rebate programme? The SABS is finalising the testing issues and standard alignment around low pressure systems. We expect the availability of tested low pressure system to increase going forward. How are companies making use of solar water heating in South Africa? For how long is the programme/rebate for installing solar geysers likely to run? The department of energy will ascertain when solar technology has adequately been supported by rebates. According to the Eskom facts provided, 6.4 GWh are saved by the solar water geysers currently. How does this translate into the power required to supply the average South African household for a day, month, or year? Every household uses different amounts of power, depending on the income, sector and region. The average middle-income home uses between 600 and 800 kWh per month. At a consumption of 600 kWh per month the saving from the solar programme to date will supply 889 homes with electricity for a year. Bulk installations such as when a developer builds a complex of townhouses or flats, can claim an incentive per installation. Contact our Solar Help Desk at 011 800 4744 for information around these installations.